Another day, another selection of Star Wars merch seen below is a lightsaber umbrella marked with the Rebel Alliance logo. 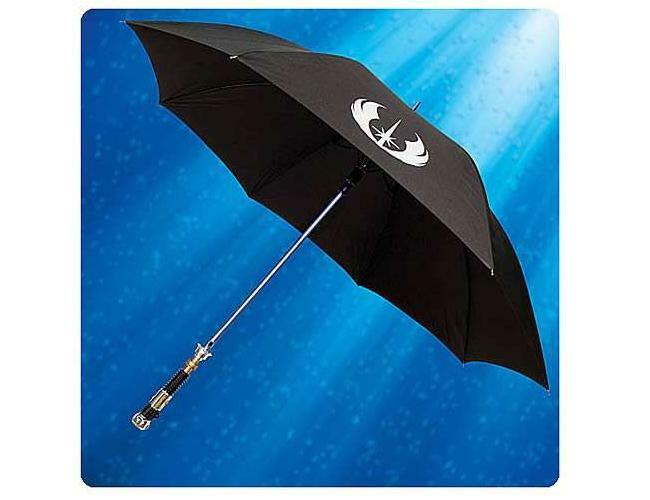 There ally exciting part is the umbrellas have lightsaber handles and won’t be available until next year. Yup, really exciting. /sarc! Seriously though, these umbrellas come in three variants. There’s the Rebel Alliance pictured (a.k.a Obi Wan Kenobi), then another with the Galactic Empire logo plus a special edition Anakin Skywalker ‘brella. So these umbrellas, which are all in black and have lightsaber handles, do they do other stuff besides protect the holder from the rain? Uh, no. The umbrellas are going to sell for $37.99 each. For any details that were missed (unlikely), check the source link down south.